I’m totally blowing my first month’s salary (for my new job that i haven’t even started yet) by taking a few (supposedly harmless) trips to my local mall. Remember how I bought a pair of $156 jeans the other day (i’m still madly in love with them, though terrified of washing the pair. i think it’s ridiculous to dry clean jeans, but i also don’t want to destroy a pair of $156 pants in the washer/dryer) — anyway, yesterday I bought another pair. And this one needs a good hemming in order not to cover an extra 5 inches of imaginary calf. Nordstrom is dangerous for me. Given, I’ve learned to control myself when it comes to buying clothes that I know I’ll only wear once. Still, my basket full of dry cleaning is awaiting my dragging it to the cleaners and spending $150 or so to get it all cleaned. I hate wearing clothes more than once in between washes, but I’m learning to get over that as well… especially my dry cleaned items. Dry cleaning is so damn expensive. Why must all of the nice clothes be dry clean only? I hate that. At least men’s dry cleaning is fairly cheap. I love the places that advertise $1.00 per shirt, then I bring in my shirt and they say – ‘oh, that’s the men’s price. your shirt costs $3.50’ or whatever the marked up price is. In one of my sociology classes in college we watched a investigative piece about women getting overcharged for things, and in one part of it a guy brought a woman’s shirt to a dry cleaner and he was charged the lower fee, then a woman brought in the same shirt and she was charged more. WTF? Anyway, I really have no right to complain about that when I just spent $153 on another pair of jeans. And I really shouldn’t have. Well, they just looked so great with that $66 shirt that actually made me look attractive. Now, those $153 were actually on sale. I wasn’t familiar with the brand, but I was browsing the Saavy department of Nordstrom (where I have constant clothiorgasms, similar to the ones i have in the “Impulse” section at Macy’s)… the goal of the trip was to find a pair of True Religion jeans to try on (someone mentioned the brand on this blog so I figured I’d check them out and see if they happened to fit better than Joe’s brand). 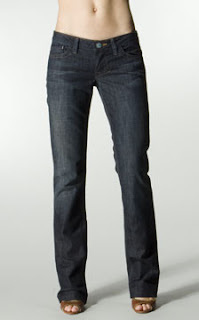 Well, I found one pair of True Religion jeans but they were this fugly dark wash that wasn’t my style. Then I found myself browsing the other jeans and noticed one brand way in the back of the too-cool-for-school section of the store. I’m not sure how denim designers think they can get away with charging $230 for a pair of jeans, but for this one brand that price tag seemed standard. I wasn’t going to bother trying on that brand (I was afraid I’d fall madly in love with them and splurge $230 for the pair) but then I was browsing the sale rack (sale in the expensive department just seems like the wrong word to use) and found a pair in my size by the same brand… on “sale” for $153. That brand, William Rast, is apparently Justin Timberlake’s denim line. Justin Timberlake has a denim line? See how much I know about fashion. Anyway, I tried on the jeans and lo-and-behold they fit quite nicely. But I think it was the way they looked with the purple shirt I tried on that sold me on the pair. After all, my goal was to buy one more pair of jeans… light wash… to balance out my wardrobe. These jeans were NOT light wash. They’re almost the same tone as my Joe’s pair, except the hue leans slightly towards a grey-blue, whereas my Joe’s jeans are true blue. So when paired with a color, they are less distracting and I feel like they match better. I still feel silly about wearing jeans by Justin Timberlake. I tend to avoid all of the rock star designers… J Lo, P Diddy, etc. They can mark up their prices to ridiculous amounts for no reason other than their celebrity. Still, the jeans fit, and as far as I know I’ll be able to wear jeans most everyday to my new job. If that’s true, it makes sense to own a few pairs of quality jeans. Right? Ok. If you haven’t figured it out yet, I’m really bad with money. I was such a spoiled little kid. Of course, I never bought $200 jeans when I was younger. But it was common to spend upwards of $1500 a season buying new clothes. I’d buy A LOT of clothes for that price (whereas now I could see spending that much and getting maybe three outfits). If I found one shirt I liked, my mom would basically force me to buy it in every color they sold it in, even if I hated all the other colors. I was always aware of things being pricey, and would rather spend $30 on a shirt (and buy 10 shirts) than buy one $130 top. Bad spending habits are hard to break. I’ve told my boyfriend that as soon as I start my new job, I’m going to make and stick to a strict budget. I think it will be fun to start saving and splitting that savings up so I can put, say, $50 a month into a shopping fund and then when a new season rolls around, I can limit my spending to the money I saved for shopping. If I don’t want any new clothes that season, I can keep saving. It’d be fun to go shopping with $1000 to spend once a year. And then I wouldn’t feel guilty for buying a $66 shirt that I’m madly in love with. I just need to keep myself away from the mall. I went there yesterday to go shopping with my boyfriend. I was supposed to be looking for shirts for him. But then I ran into Nordstrom just to check out those True Religion jeans and, well, the rest of the story is history. I’ll try those jeans on again tonight and see if I really like them, then i’ll take them to get hemmed at some point. It’s about time I visit the dry cleaners anyway.